A bronze mask depicting a horned bovine. The face has bulbous eyes with pierced pupils, a broad, ridged nose with flared nostrils, hooked jaws, pointed ears and prominent, upswept horns. The top of the head has a domed cranial extension, which is pierced with two small holes for attachment. A diamond-shaped boss is placed between the eyebrows. Between the horns and ears, also beside the wings of the nose, there are two small holes for attachment. The bronze shows traces of gilding, but is mostly covered in a grey-green patina with small areas of malachite and ruby encrustation. 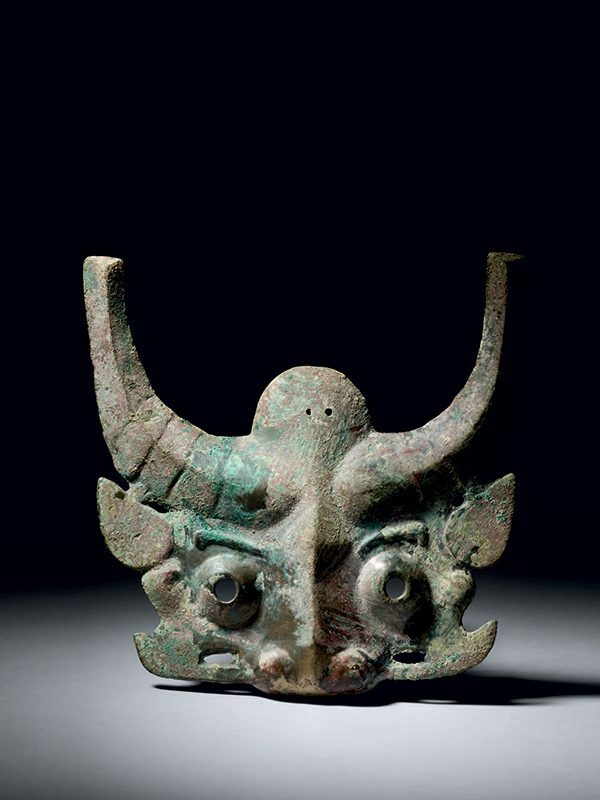 Bronze animal masks, popularly made from the early Shang to the mid Western Zhou dynasties, have various shapes and functions. At least four known different uses for masks like this have been identified according to recent archaeological studies, including adornments on shields; attachments to the front of a horse’s head; harness plates on chariots; and decorations on ceremonial or ritual tools. Chai illustrates two closely comparable bronze masks, both excavated from Shaanxi province and dated to the late Shang dynasty, identified as adornments on shields. A very similar bronze mask of closely comparable style and size from the Werner Jannings collection is now is in the Palace Museum, Beijing. A slightly smaller bronze mask of comparable style and function, excavated from Shaanxi province, is in the Shaanxi Provincial Museum.